Factory owners: PA deliberately cuts taxes so that Israeli industry can't compete; Bennett must intervene. 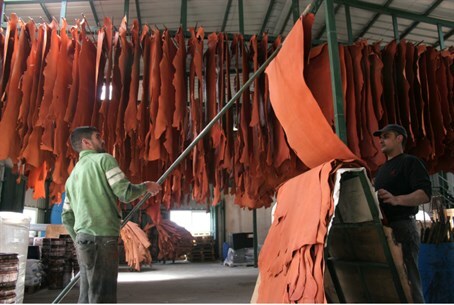 Israeli factory owners in the textile and furniture industries have called on Minister of Economics and Trade Naftali Bennett to tax Palestinian Authority-area goods in order to save Israeli industry. Despite its reported financial crisis, the PA is deliberately taking in less tax income than it could in order to hurt Israel, says factory owner Shaul Ben-Yosef, who spoke to Arutz Sheva. Israeli factories are currently forced to compete with PA factories – a competition that is heavily biased in the PA’s favor, he said. “They don’t pay municipal tax or other taxes, so they can sell things cheaper. I sell bags for 10 shekels a kilo; they can sell them for eight,” he explained. “They’re slowly taking over. The Palestinian Authority tries to damage anything linked to Israel… They are subsidizing the goods that are exported to Israel, and dealing a mortal blow to Israeli industry,” he warned. “Because the differences in cost are huge and factories are on the verge of closure, or have shut down production in favor of direct trade with factories in the territories, our request is that they impose a defensive tax, equal to the difference in costs,” he proposed. All factory owners are asking for is “an equal opportunity to compete,” he concluded.